Over 10,000 people came to see history being made at the Arena Birmingham on January 28th as Ashley Harris of Nottingham Wildcats and Tricia Oakes of Caledonia Pride starts the Women’s British Basketball League (WBBL) by tipping the ball. The crowd sits on their edge of the seats as the game continues to be neck to neck throughout the first three quarters. Nottingham has been to five WBBL finals in the last three seasons; however, has not won one. And the Scottish team, Caledonia have only been playing their second season in the WBBL, which makes it hard for everyone to truly pick a side. As the fourth quarter drew close, the Nottingham Wildcats were able to secure the title and scored 70-66 over Caledonia Pride and Ashley Harris named MVP. 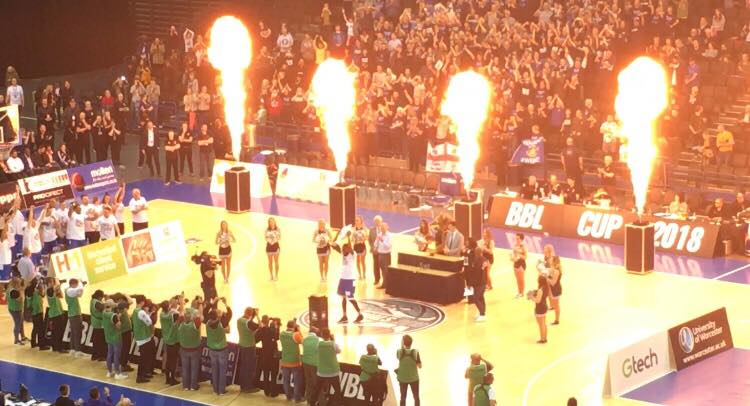 In between the WBBL and BBL, the famous Pro:Direct Slam Dunk Contest was incredible. The highlight of this was perhaps Manchester Giants’ Austin Rettig who lined up four mop boys and slam dunked on them. Rettig scored an overall 58/60 which ultimately made him the 2018 Pro:Direct Slam Dunk winner. Worcester Wolves’ Dallin Pachynski secures the first quarter by scoring most of the points with 25-21 over Cheshire Phoenix; however, the Wolves seemed to fall behind after that for the rest of the game. Ending the first half with a foul from Phoenix, the score was 41-40 with Wolves falling short on one point and the fans continue to cheer for their team as the third quarter starts and the game became either team’s territory. However, as the fourth quarter draws to an end, the Wolves was beaten by the Phoenix with the score of 99-88 and Malcolm Riley named MVP. The Wolves played a mean game and there was fair competition throughout. Overall Malcolm Riley scored 26 points for the Phoenix and Michael Ojo scored 18 points for the Wolves. Both teams did incredibly well, and truly had the crowd roaring and supporting them all the way.